So you’re going on a trip and need a dependable backpack? This comparison list of the Best Travel Backpacks 2020 will help you find the right one. Whether you’re looking for a hiking backpack, laptop backpack, or just a cheap backpack for traveling, we’ll help you find one that is durable, lightweight, and won’t let you down. We’ve compiled the Best Travel Backpack 2020 list to help make the decision a lot easier when deciding on your next travelpack. We’ve narrowed it down to the top 10 best travel backpacks of 2020. When it comes to finding a travel backpack that is lightweight, durable, affordable, and compact, the HIKPRO Lightweight Travel Backpack is at the top of the list. Why spend $100’s when the HIKPRO can do it all for less? 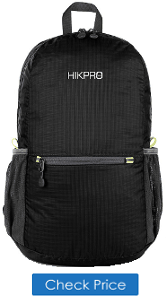 Lets take a look at why the HIKPRO Travel Backpack leads the best travel backpack 2020 review. The HIKPRO Travel Backpack is made out of tear and water resistant nylon and SBS anti-abrasion zippers making it durable enough for almost any use. It’s also extremely light, weighing in at only 6.9 ounces and can be folded into the size of a sandwich bag, making for easy storage in a purse, briefcase, or pocket. The HIKPRO Travel Backpack does not have the largest carrying capacity on the best travel backpack 2020 list, but it is capable of holding 1,220 cubic inches or 20 liters with up to 40 pounds of weight. It’s breathable mesh straps make for a comfortable experience. The HIKPRO Travel Backpack is designed for low to medium use for quick day excursions. It’s light and can be folded up for easy storage until it’s needed. It’s also water resistant should it be subjected to the elements, and at less than $20 is hard to beat. For all these reasons, the HIKPRO Travel Backpack leads the pack as the Best Travel Backpack of 2020. 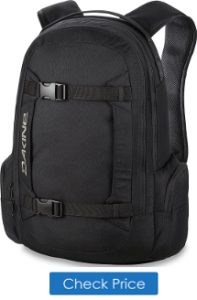 Dakine makes some of the most popular Travel Backpacks around, and the Mission Travel Backpack is near the top. It comes in an astonishing 32 different design patterns making it the most customizable day pack in the best travel backpack 2020 review. If you are looking for cool backpacks, this is it. Constructed of 600D Polyester, the Dakine Mission Travel Backpack is plenty durable for medium use, quick day trips, and snowboarding. It’s not as strong as the 420D Nylon used Osprey Quasar Travel Backpack, but you will likely not notice the difference. It can hold up to 1530 cubic inches or 25 liters, making it’s capacity greater than the HIKPRO Travel Backpack, however, it’s not as light. 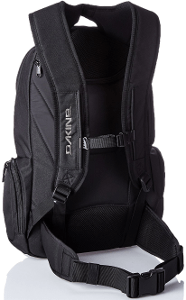 The Dakine Mission Travel Backpack has comfortable extra padded straps and a handy belt and chest strap. This travel backpack is going to stay put no matter what. You can even strap a snowboard to it since it’s durable and strong enough to handle the weight. With the 32 color variations, water resistant 600D polyester, comfortable strap system, and affordable price, the Dakine Mission Travel Backpack ranks high on the best travel backpack 2020 list. 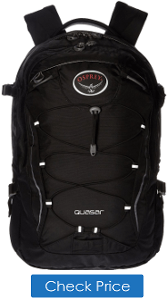 The Osprey Packs Quasar Travel Backpack is another very capable pack that scores highly in the best Travel Backpack 2020 list. 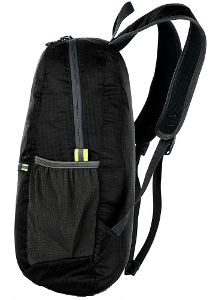 While considerably more expensive than the HIKPRO and Dakine bags, the Osprey Quasar is constructed of the more durable 420D Nylon and provides a considerable increase in storage space due in large part to it’s greater depth. 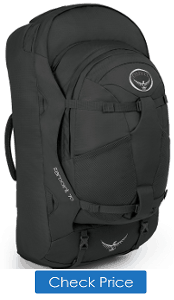 Weighing in at just 1.69 lbs, the Osprey Quasar Travel Backpack is relatively light. It’s equipped with padded inside sleeves to protect laptops and other items that will inevitably get bumped around. 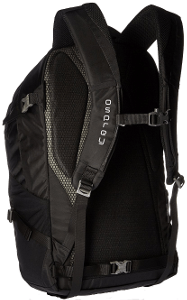 The The Osprey Packs Quasar travel Backpack is one of the best backpack brands around. For a durable travelpack that will do it all, this is the rucksack backpack you want. The Favofit Lightweight Travel Backpack is one of the most affordable and lightest packs on the Best Travel Backpack 2020 review. It weighs only 0.7 pounds and can be found for under $20 at Amazon.com. This travel pack is great for those long day excursions where pack weight may be an issue. It can be packed into a small pouch for easy carrying, while opening up to provide an astonishing 35 liters or 2,135 cubic inches of storage space. The Favofit Lightweight Travel Backpack is one of the largest capacity travel backpacks in the review and towers considerably over the HIKPRO, Dakine, and Osprey. 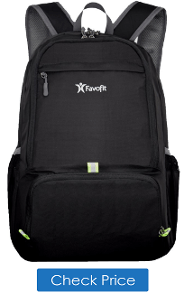 For a cheap travel backpack with moderate durability, the Favofit fits the bill nicely. While it doesn’t have some of the features found in the Dakine or Osprey, it still makes for a great entry level travel backpack for those on a budget. Check Out the Best Pocket Knife 2018 – Buyer’s Guide! 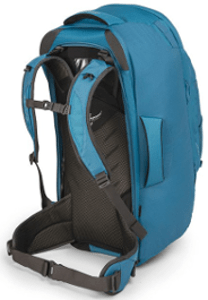 The largest pack in the Best Travel Pack 2020 review, the Osprey Farpoint Travel Backpack is also the most durable, has the largest storage capacity, and is the most expensive. If you need a travel backpack that will withstand it all no matter what, and carry a bunch of stuff too, then look no further. The Osprey Farpoint Travel Backpack is constructed of durable 210D Nylon that can withstand far more abrasion than most of the lightweight travel packs already mentioned. It’s capable of holding up to 70 liters or 4,200 cubic inches of storage. This is almost twice as much storage room than any other travel backpack on the list. It’s also considerably heavier at almost 4 pounds. This is one heavy duty travel backpack that checks all the list for rugged use while carrying a large amount of items. If you’re looking for a lightweight day pack, look elsewhere! But if not, the Osprey Farpoint Travel Backpack is the one of the backpacking backpacks to have for your serious travel backpack needs. For carrying more items, you might look to rolling backpacks to help manage the weight. 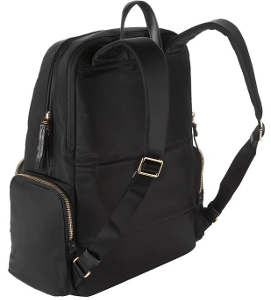 Tumi has developed the Voyageur Calais Travel Backpack as a modern touch of style combined with functionality. It has a designer look that others in the Best Travel Backpack 2020 review just can’t match. It’s made out of 100% Nylon with leather trim and a leather carrying handle. It’s designed to carry laptops up to 15 inches and external pockets are set up for quick access. It’s the only travel backpack on the list that is designed more for fashion and business, than for quick day trips or traveling. The Voyageur Calais Travel Backpack is also one of the smallest at just over 1,000 cubic inch carrying capacity and weighs in at 1.9 lbs. This is the ideal travel backpack for women or those wanting a smaller pack. This isn’t the travel pack for outdoor use, but makes a good laptop and electronic carrying case. It’s available in 3 colors: Black, Cayenne, and Khaki. 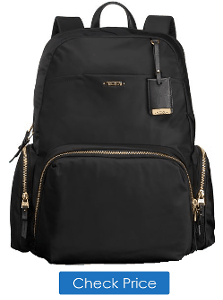 The brass colored zippers really make it stand out and add a sense of style most other travel backpacks don’t possess. 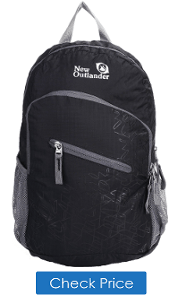 The Outlander Packable Travel Backpack is another 100% Nylon pack that is lightweight and foldable for easy storage. It’s the lightest pack on the Best Travel Backpack 2020 review at just 0.5 lbs. This is the ideal bag for a carry on item when flying since it can fit under you seat or in the overhead bin with ease. The Logo also looks like a North face Logo from afar! The water resistant nylon makes it perfect for light outdoor use, but it’s not waterproof so keep that in mind. It’s capable of storing up to 2,000 cubic inches or 30 liters of gear which is pretty standard for travel backpacks of it’s size. The Outlander Packable Travel Backpack is a cheap pack that offers the basic features that you would expect in a travel backpack. It’s lightweight and provides a storage capacity capable of holding smaller to medium sized items. For under $20 you really can’t go wrong with this pack for light to medium use. 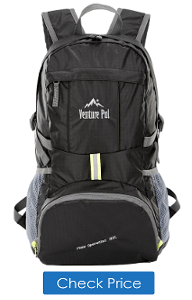 For another travel backpack around $20, the Venture Pal Ultralight deserves a good look in the best travel backpack 2020 review. It’s storage capacity is almost 1,000 cubic inches or 10 liters more than the comparable HIKPRO. 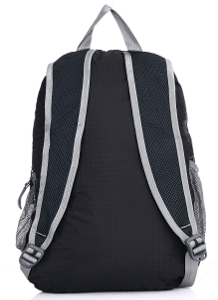 Made of lightweight Nylon, the Venture Pal Ultralight Travel Backpack weighs in at just 0.7 lbs. It’s perfect for light day use or travel. Like most others in it’s class, it folds into it’s own pocket for easy storage that will fit almost any place. 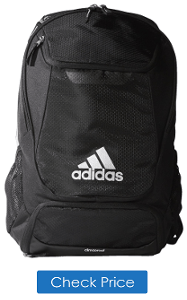 Helping round out the top 10 best travel backpack 2020 review is the adidas Stadium Travel Backpack. Popular among soccer players, this pack easily transitions into a very capable travel or day trip backpack. Made of durable 750D Polyester, it also features a Hydroshield water-resistant outside layer and a Climaproof water-resistant base. If you need a travel backpack that will perform well under all conditions, then this is it. The water-resistant capabilities are better than all other travel packs in the review. For an all weather travel pack with decent storage capacity and at an affordable price, the adidas Stadium Travel Backpack should be considered as your next pack. Although it’s designed for soccer players, it still can be converted into a nice travel pack. This is the most common question that comes up when searching for a travel backpack. How much space do you need and how exactly do you convert measurements of liters or ounces into something your familiar with? The first question is easy to answer since you should know how many items you plan to carry around and the size and weight of each. So now you just need to know how this translates into the popular size travel backpacks available today. 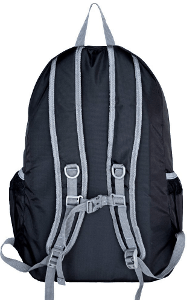 Most popular packs, such as laptopbackpacks, hiking backpacks, and rucksack backpacks all typically list the liter size in the model number. For example, the Osprey Packs Farpoint 70 Travel Backpack previously listed in the Best travel Backpack 2020 list, is a 70 Liter Backpack. As a point of reference, it would take 35 2-liter bottles of liquid to fill up the Osprey Packs Farpoint 70 Travel Backpack. That’s quite a lot of room to store items. A smaller size pack, such as a 40L backpack, would be the same capacity of about 20 2-liter bottles of liquid. The other common measurement of capacity listed for travel backpacks is cubic inches. This tends to be a more accurate depiction of the overall capacity since Liters are often rounded to the nearest 10th for a nice clean number. It looks better to say the Osprey Packs Farpoint Backpack is 70L rather than 4,200 cubic inches. You can always convert cubic inches into Liters to get a more accurate number. As a general rule of thumb , the following list of sizes is a great place to start when deciding how large of a travel backpack you might need. Up to 40L – Small Daypacks designed for quick excursions. 30-50L – Overnight Trips designed to carry just a little bit more. 40-70L – Weekend Trips designed for extended stays. 70L+ – Extended Trips of up to a week or more. As you can see, it’s often helpful to decide what activity you might be doing in order to gauge which size travel backpack will meet your needs. You can also check out travel guides on how to pack items in a more efficient manner. 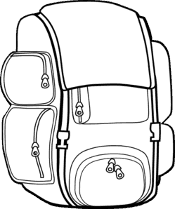 There are many great ideas out there on maximizing space in small backpacks. 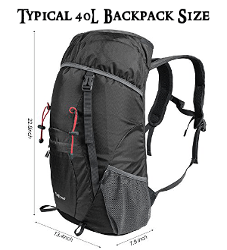 Is a 40L Backpack the Ideal Size? Since most people will only be using their travel backpacks for quick day excursions, a 40L Backpack will suit most needs. It will hold several changes of clothes, a laptop, and other small essentials. For those wanting to travel light and minimize the weight they have on their back, then a 40L backpack or less makes perfect sense. Ultimately when deciding what size travel backpack to purchase comes down to listing all the items you plan on carrying. This will give you a great visualization of what it might take to store all these items and if they are even needed at all. If you are traveling with others, you may even be able to distribute items in a way to reduce the sizes of travel backpacks for everyone involved. Maybe you can even eliminate some things you don’t really even need. I’m sure your back will thank you. 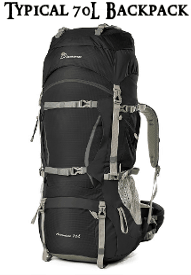 If day excursions aren’t your thing, then you will definitely need a pack that is more substantial than a 40L backpack. This is where the Osprey Packs Farpoint 70L travel backpack and others really shine. They can hold a ton of items, so minimization really isn’t as big of an issue. Since the large hiking backpacks will be holding a lot more weight, you’ll want to key in on features that will help you distribute the increased weight on your back and do so in the a comfortable manner. Pay attention to padded straps. The wider the shoulder straps the better. They will distribute the weight more evenly. Also look for stabilizing belts that will help reduce the shifting of the hiking backpack since it will likely hang a lot lower on your back and can shift if you’re in rough terrain. If you keep these key aspects in mind, finding a travel backpack that fits the activity you will be doing will be a lot easier. There are many travel backpacks out there of all different sizes, shapes, and designs. Hopefully the best travel backpack 2020 review helped you find the pack that will meet all your needs. Whether it’s a cheap travel pack, a lightweight backpack, or one with large storage capacity, we’ve listed several that should get the job done. Most travel packs listed meet airline carry on dimensions so traveling with less hassle will not be an issue. If you need more capacity or can’t carry a lot of weight due to back issues, look to a backpack with wheels as an alternative.